Call me Robinson. If you're exploring the island, leave it to me! You can depend on me, Captain! Leave it to me, I'll fire my gun! Fire at the target! Leader's Majesty in One Strike, Island Divider! Heheh...didn't I say I'd protect you? A mysterious Transient boy going by the name of Robinson upon whose shoulder rides something resembling a parrot. The tattered ship captain's outfit that he inherited is his prized possession. An experienced drifter, he was washed up on many the shore of another world's island, only to be carried off again with the tide of what he calls his exile. It is on one such island that he meets you, from wich point he treats you like family and hungers to show you his dependability. He offers the love of a parent to thos who have been separated from their own, and holds a particular affection for anyone connected with the man who gave him his start. 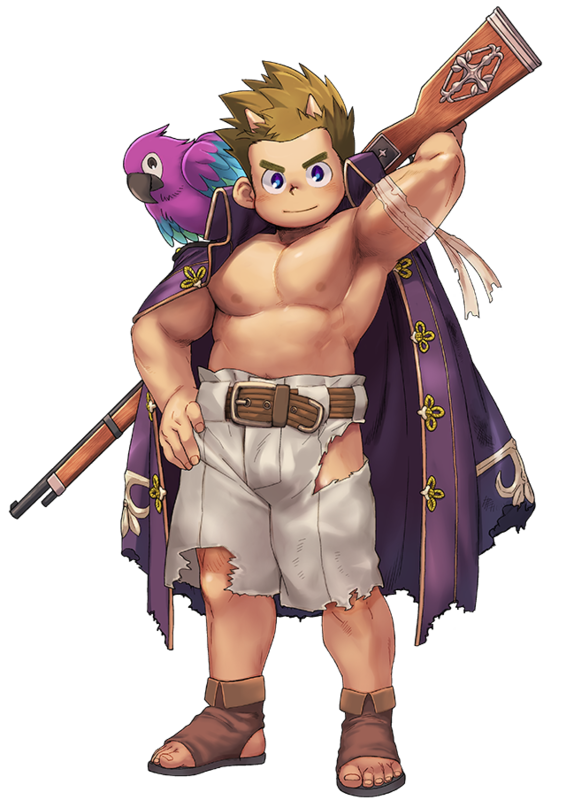 An enigmatic boy Summon who calls himself Robinson and carries a parrot something or other on his shoulder. He favors the tattered captain's coat he inherited from someone. He has repeatedly drifted to and from islands of other worlds countless times and is a castaway with an abundance of experience. Robinson himself refers to this as "deportation." When he met the protagonist on this hidden island, he loved them like family and is eager to show himself as reliable and strong willed. Those separated from their own parents stir feelings of deep affection within him. Additionally those who remind him of who he used to be and those related generally give him a sense of familiarity. Though he favors a single shot musket, his Sacred Artifact is in fact the Ammunition, and not the gun itself. His Rule allows him to split one thing into two, allowing him consecutive firings of his gun. This Rule is similar in some ways to your Rule of Rending. A single shot can attack only a single point, but with a second shot, a line is drawn between the two bullets, rending all in the path of that line in two. Robinson considers it a waste when someone has a perfectly good home to return to and yet never goes back, and has no qualms expressing his disdain. In battle he favors one-shot muskets, but it is less the gun and more the shots fired from it that is the true nature of his Sacred Artifact. With the power to "divide what was originally one into two" it is possible for him to use the gun as though he has four hands. This power resembles the power of "severance" held within the protagonist's sword. One shot is just a point, but two shots create a line, which when shot at a target splits it in two. He has no problem with calling comrades who can go home but don't privileged, and does not have that good an impression of them. There is a missing outfit in his speedos actually. Ohoho, it most differently is! I assume that’s intentional. If his alt outfit was on the wiki, people would FLIP! Literally just you. Solely you. Heh, he looks really cute. I like him. 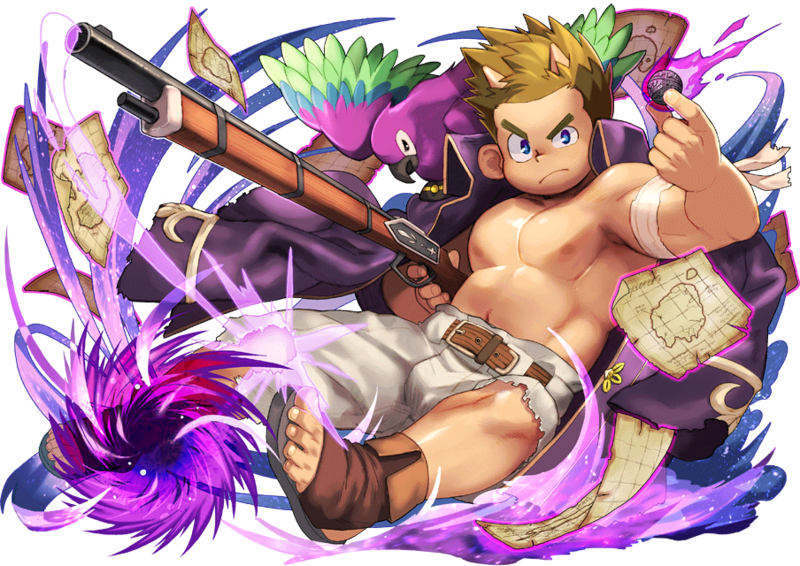 Also I want to see this artist draw more characters in this game cause I really dig there art style! This page was last edited on 6 March 2019, at 13:16.